"If you are reading this I am grateful you are here and for your interest in my art." Born in California, Carol presently divides her time between the mainland and Hawaii where her studio overlooks the lush tropical landscape of the beautiful Island of Maui. "I am constantly inspired by sunsets, rainbows, and the jewel colors of the coastal waters-all outside my windows." Working primarily in acrylic, she also uses watercolor in plein-air for field sketching and in finished works. "Painting on location forces me to work intuitively, quickly capturing the basic composition and color relationships in a scene." This combined with her imaginative ideas has led to a wide and varied range of work. As a romantic impressionist painter, Carol creates works of art enticing viewers into a realm blending fantasy and realism. Finding the imagined irresistible, mermaids, fairies, dragons and other mystical creatures are often seen tantalizing children and adults alike. Frequently, figures are obscurely interwoven into her scenes evoking an intimate and sensual mood. "I am attracted to the feeling of an image, its ability to stir up emotions, whether it is a passionate moment between two people embraced on a beach at sunset, a still life that conveys a sense of warm comfort, or an abstract interpretation of spiritual expression." Carol began selling her artwork in high school and has been exhibiting in galleries ever since. For almost three decades her images have been acquired by corporate and private collectors worldwide, and reproduced as prints, greeting cards, collectorÕs plates, and magazine covers. When you "feel the beauty" the way Carol Armstrong does, the result is nothing less than enchanting. 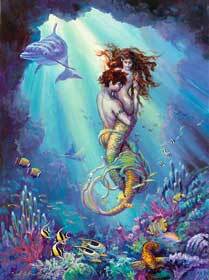 One of Carol's most recent paintings portrays the "Undersea Romance" of entwined Merfolk. Another,"Mermaid's Fairie Castle," captures fairies arriving at a magical ball held in a delightful sand castle built by a young Mermaid.